Above: “Food Fight!” shouts John Belushi as the irascible John “Bluto” Blutarsky in the film Animal House by Universal Pictures. It was stress time. 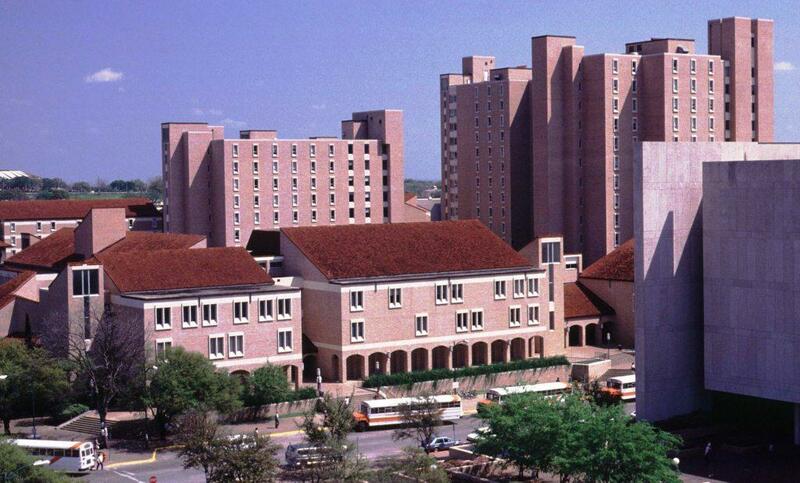 For UT students in the spring of 1982 – as it is today – the dreaded last week of classes was about as popular as an Oklahoma Sooner at a Longhorn tailgate. Professors smiled as they distributed yet another round of tests (Don’t forget your blue books! ), semester-long projects and research papers were due, and final exams loomed just over the horizon. The harried inmates of Jester Center, the University’s largest and at the time only co-ed residence hall, were up at all hours and bleary-eyed, living off caffeine as they sprinted to the end of the academic year. That’s when the flyers appeared. They were everywhere. Posted along the hallways, in the elevators, on the bulletin boards, in the bathroom stalls, no one could miss them. And in those ancient and primitive times before email, the internet, and social media, flyers were one of the best ways to get the word out about something. Students took notice. “Don’t be left out in the cold. 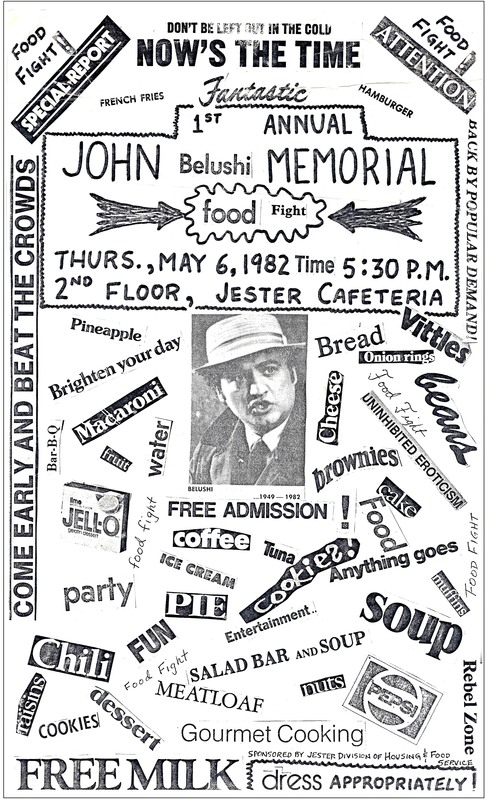 NOW’S THE TIME.” With great fanfare, the flyers announced the first annual John Belushi Memorial Food Fight, set for Thursday, May 6th on the second level of the Jester Cafeteria. 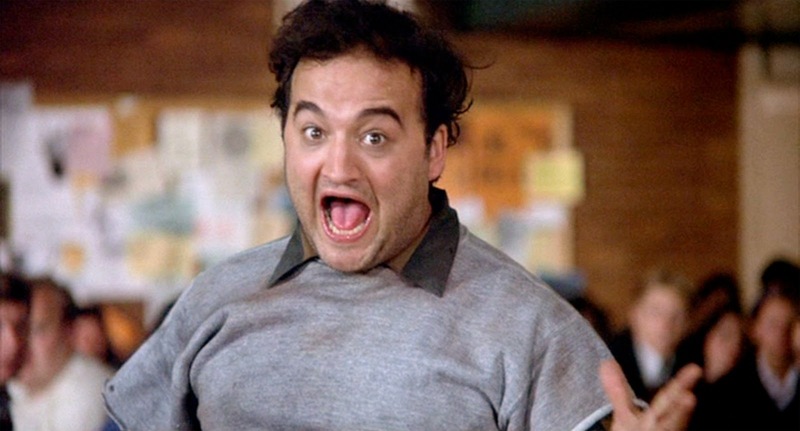 Belushi, famous for his performance as the college degenerate John “Bluto” Blutarsky in the film Animal House, had died two months previously in early March. A food fight?! In the Jester cafeteria? This didn’t seem like the usual program the dorm’s resident assistants (RAs) would organize. But there it was, plainly printed on the bottom right hand corner of the flyer: “Sponsored by the Jester Division of Housing and Food services.” That sounded official. And how thoughtful for the housing office to provide a way for students to let off a little steam before final exams. Above: The infamous food fight flyer, created by cutting out words from magazines and newspapers, taping them to a sheet of paper, then running off copies at the nearest Xerox machine. Old school technology. Click on the image for a larger view. Of course, the housing office had not organized, approved, sanctioned, endorsed, or in any way condoned a food fight in the cafeteria. Most of the flyers were removed post haste. Most, but not all. The RAs did their best to spread the word that food fights were a definite no-no. But college students, especially those cramming for tests, sometimes have selective hearing. 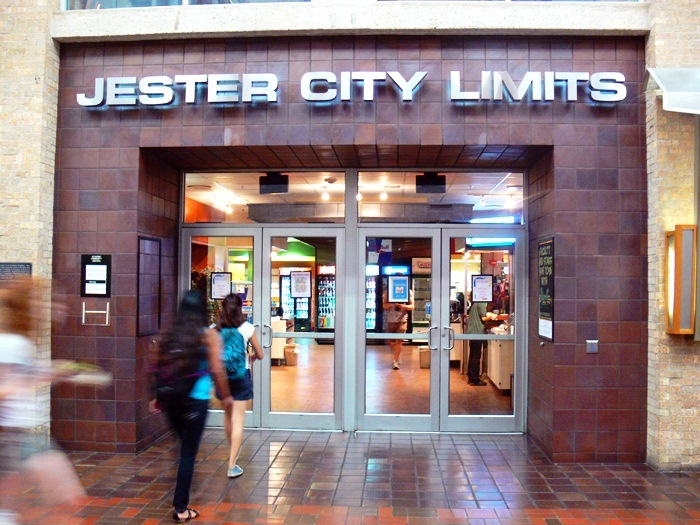 Today, the Jester Center eatery is divided into two facilities. Downstairs, the Jester City Limits resembles a food court at a posh shopping mall, and offers a broad selection to satisfy the choosiest of appetites. (Check out today’s menu here.) Upstairs, “J2” is an all-you-can-eat buffet style cafeteria with an expansive salad bar. As college fare goes, today’s Housing and Food Services does an outstanding job. In the early 1980s, though, Jester’s dining options were decidedly more limited. Students trudged through one of eight cafeteria lines – four on each floor – and chose between two entrees. One line on the second floor served greasy hamburgers as the lone culinary alternative. Around campus, the Jester potato balls were the stuff of legend, and everyone was wary of the unpredictable and mysterious effects of the Jester chili-mac. On the appointed day, a much larger crowd than usual gathered for dinner on the second floor. Some students arrived with umbrellas or in ponchos, even though it was a clear, sunny day. One couple unabashedly showed up in matching garbage bags with holes cut out for heads and arms. Everyone had an appetite, or at least their plates were full. The salad bar could barely keep up with the demand. Spectators loitered along the second floor open hallway outside the cafeteria, trying their best to look nonchalant even though they were three persons deep. Tink! Tink! Tink! Tink! Tink! At precisely 5:30 p.m., the sound of a lone knife clinking against a glass was heard in the northwest corner, soon joined by others until a cacophony swelled through the dining hall. Heads were on swivels, eyes alert for a surprise attack. Once the first biscuit was launched, the armistice was over, and for one brief, shining moment, the Jester Center cafeteria was a scene from Animal House. Above: Headline in the Daily Texan. Not an all-out battle, it was a quick series of skirmishes. Students dove under tables with their ammunition and then fired when they thought it safe. Chicken wings found flight one last time. A spoonful of corn became scatter shot. Garbonzo beans were surprisingly accurate. The crowd outside the dining hall roared with approval. Amidst the confusion, RAs braved the cross-fire and rushed to confiscate the student IDs of anyone doing more than just ducking for cover. This entry was posted in Uncategorized and tagged Food Fight, Jester Center, Jim Nicar, John Belushi by jimnicar. Bookmark the permalink.